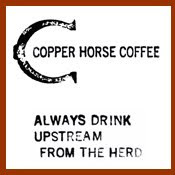 Given the constant coverage of coffee in New York City these past years (such as $12 cups of coffee, Westerners bringing their roasting operations east, etc. ), it's easy to forget about places that have been in the area for much longer then New York's late-coming obsession of quality coffee. I got a shipment from Oren's Daily Roast, a coffee company that's been around since the 1980s and remains a place that I've managed to miss in my occasional rushings around the city (busyness tis a poor excuse). 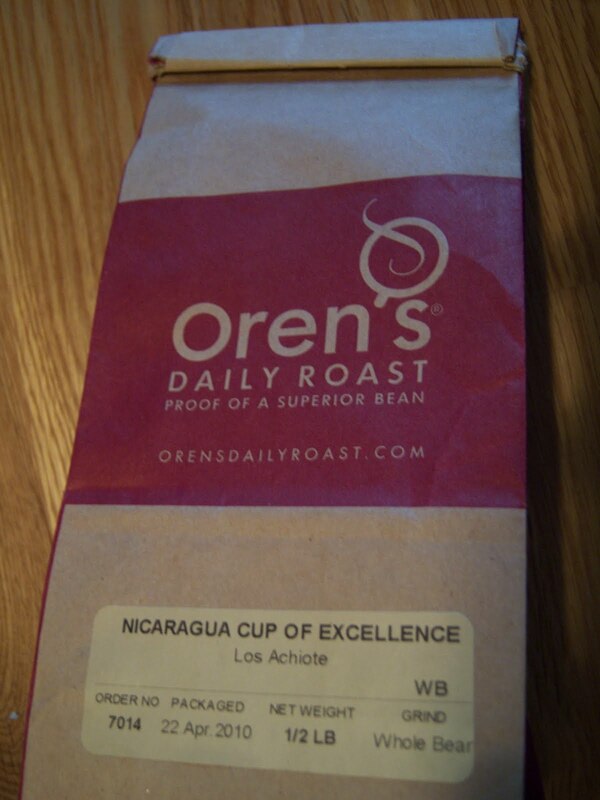 Of the brace of coffees sent, I spun the proverbial wheel of destiny (I spin it for such occasions) and began with Oren's Cup of Excellence from Nicaragua Los Achiotes. I kicked it off with a filtered brew of the coffee. The result displayed a saucy, rock candy, IPA-ish coffee with bits of caramel, nougat and some wheat grass. A good cup with a bit of a bitter aspect. 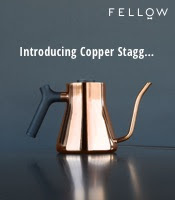 The french press was darker, producing a whiskey-esque bitterness and sweetness, some dark chocolate, a little hops, a little grass (less then the drip) and a tiny bit of tea rose. More bitterness and a heavier body in this infusion. The siphon birthed a more of a caramel, bran-like child with the sauciness of the drip as well as the flavors of wheat grass, nuts, hops and grapes. The least bitter and smoothest of the three methods. Overall the coffee held to a good quality, though it didn't really strike me as Cup of Excellence level product (for me, the bitter and saucy facets weren't the most enjoyable). 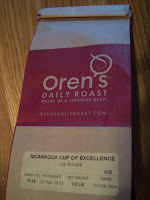 Nonetheless, if you're aiming to try one of Oren's Daily Roasts, take a crack at this COE from Nicaragua. I usually do not leave a comment, but the ideas really rocks, also I have a few questions like to ask, what's your contact details?